"As a child, I always loved to sing and was often found on our backyard swing...singing, singing and singing. Our yard backed onto a wonderful park, and my first audience was the unsuspecting wildlife that lived there. I don’t remember having many songs in my repertoire at that tender age, but I do remember making up songs about anything...and I mean anything that came to mind...or came into sight. 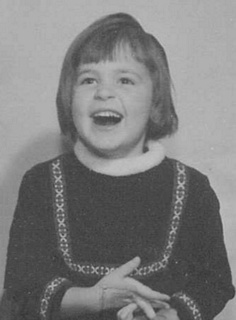 I felt such joy, such gleeful abandon to be in my own little world that allowed me to let my voice soar! I believe my gift of song was a gift from my mother, Robin, as she loved to sing and inspired me in so many ways. I followed in her footsteps in taking singing lessons at the Royal Conservatory of Music, singing at our Church and joining her in performing with talented performers in a group called “Happiness Is…” I learned from her the joy of sharing my gift with others. My very first collection of songs were recorded in my basement for a high school Theatre Arts project. 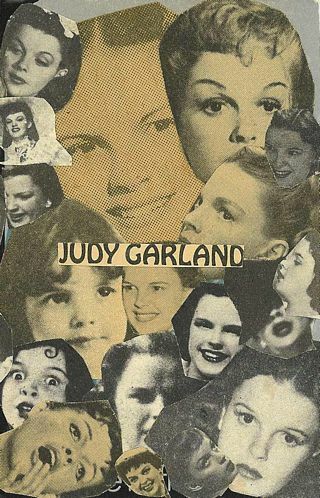 I had always been a fan of Judy Garland, so I picked my favorites Embraceable You, The Trolley Song, Look For The Silver Lining…to name a few, and with the help of my dear neighbor Helen Hughes on the piano, I was on my way. I still have that old dusty cassette tape with its microphone pops, vocal mistakes and tiny stars that my treasured teacher, Mr. Brown marked beside his favorite songs. Those tiny stars meant the world to me, for it crystallized that I could create something that could be deemed a 'favorite' to someone else. The seed was planted. As my career unfolded, I was fortunate to follow my heart and the opportunities that were presented to me. While I was working as talent in television and radio commercials, and waitressing to make the ends meet...a wonderful opportunity came about with the opening of Canada’s Wonderland, for I was cast in its opening year in the production of Those Magnificent Movies. It would be my very first professional contract and I loved our production where we truly celebrated those magnificent memories of the Silver Screen. It was a production filled with phenomenal costumes, amazing sets and a wonderful experience of working together with talented performers and the fantastic Danute Maskins, who was our director/choreographer for our show. 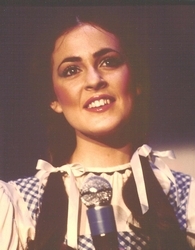 Each solo performer was hired to replicate a magical icon from the movies and I was hired to recreate Dorothy from the Wizard of Oz. With my love of Judy Garland this was something extra special for me. I also received the honor of being the very first performer to fall into the orchestra pit! Yes, I did this in grand fashion when I was performing in the Meet Me in St. Louis park scene where I wore a bright orange long ruffled & lace dress with a large hat complete with feathers, and a parasol. As I strolled along the edge of the stage...it only took a second or two before I was in the pit. I don’t know what the audience, or my singing partner Michael Day made of this occurrence, as my fall (which I hope was at least graceful...smile) did not leave me unseen by the audience. My feet slid through the safety net and left me visible from the neck up. Being in a state of shock and not knowing what to do, I just continued to sing! And so there I was... simply ‘a singing head’ with a large orange hat with feathers in place and a parasol in hand. 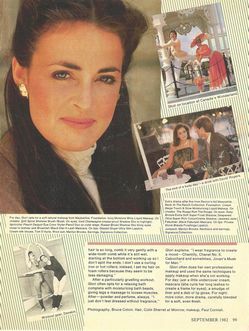 There was a lot of press given to Canada’s Wonderland, being its first year and with that I was chosen to grace the pages of Flare Magazine. I felt so special when the Flare team came to the park, to glamorize me with hair & make up, and introduce me to the stunning clothes created by Canadian designer Marilyn Brooks. I loved her designs so much that after the photo shoot, I had arranged to visit Marilyn’s downtown Toronto design studio so I could purchase the silk pantsuit that I wore in the Flarestyle article. One never knows what opportunities are waiting for us, for when I went to visit with her, we entered into a working relationship where I became her in-house sizing model and in return was paid in clothes...what a gift!! 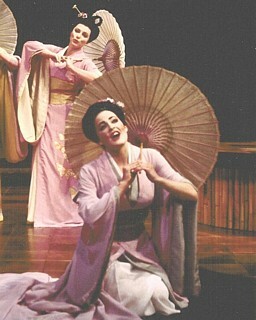 After my first season had ended at Canada’s Wonderland, I was contracted by the prestigious Stratford Festival, in Stratford, Ontario to be part of the original cast of The Mikado. I was coming from the world of Oz...or I should say Wonderland, and at the time I truly didn’t realize the significance of being part of this renowned Festival. It was a particularly exciting time at Stratford, with the partnership of Artist Director John Hirsch and director/choreographer Brian Macdonald. 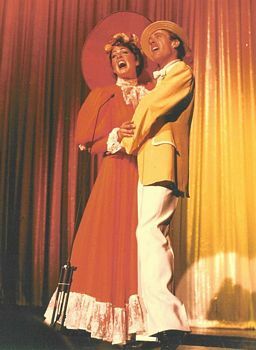 With the success of The Mikado, and the following season’s The Gondoliers, our company had the privilege to take both productions on tour throughout Canada and to film them as television specials for CBC. It was an exciting time for all of us, and being new to the world of stage I didn't realize that this extensive tour was not a regular occurrence for stage productions at least not at the Stratford Festival. It was truly the will and determination by John Hirsch and Brian Macdonald that made this happen. Their vision to share these productions were great, for no sooner had we completed the filming for CBC, we were packing up for London, England. 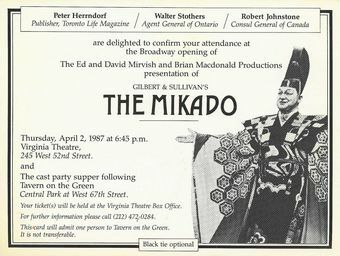 Our production of The Mikado was to perform at a very special theatre, the Old Vic Theatre, which had been purchased and newly refurbished by our beloved Ed Mirvish...also known as ‘Honest Ed’. 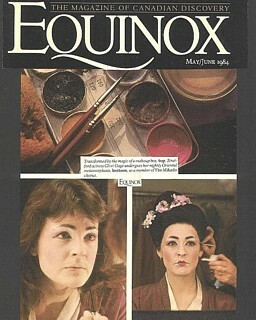 On opening night the theatre was graced with the presence of Princess Anne, Kenneth Thompson, and the mayor of Lambeth. It was a magical evening and after our performance, while still in costume, we were presented to Princess Anne. She was charming as she greeted us and looked radiant in her beautiful silk kimono which we believed was worn to honor our Japanese themed production. We remained in London for six glorious weeks and there were many a day that I would pinch myself, as I rode ‘the Tube’ to the theatre. Sometimes after our show a group of us would venture to this little place under a bridge for the best fish & chips, or we would visit an English pub! Not being one to like beer, I did grow accustomed to their ginger beer, and there I was thinking I was ‘one of the boys’ ~ drinking beer in a pub, only to learn sometime later that a ginger beer is considered more of a soft drink than beer...ha! On our days off, many of us took the opportunity to venture outside of London. A group of us drove through the beautiful English countryside to visit Stonehenge. On a separate occasion, I decided to be a true adventurer and strike out on my own, as I took a train to Bath. I learned so much about myself and others by my traveling. My eyes were opened to a whole new world, as I experienced historical sites, new cultures and amazing people. I learned so much about myself and others by my traveling. My eyes were opened to a whole new world, as I experienced historical sites, new cultures and amazing people. I learned so much about myself and others through my traveling. My eyes were opened to a whole new world, as I experienced historical sites, new cultures and amazing people. With our tour drawing to a close with the final performance at the Old Vic Theatre, many of our cast were returning to the Stratford Festival for their upcoming season. I, on the other hand, decided not to return to Stratford for I wanted to return to Toronto with the hope of landing work in film and television. As I said my goodbyes, thinking this amazing chapter in my life had come to a close, something wonderful happened the following year. 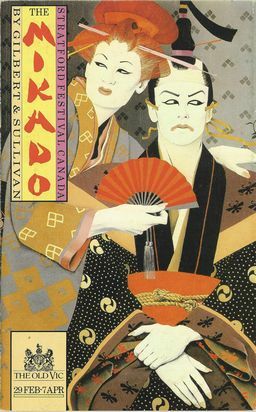 Brian Macdonald and Mirvish Productions joined forces and contracted as many of the original cast of The Mikado to remount this magnificent production....and here we were together again as we draped ourselves in our 100% hand-painted silk kimonos that Susan Benson had designed for us. It would be at this time, after our run at the Virginia Theatre in New York City, that I would finally hang up my silk kimono and close this chapter on my cherished Stratford years. Where my career had started on the stage, I was now given the opportunity to work with director/producer Kevin Sullivan who brought the much loved Anne of Green Gables to the screen. 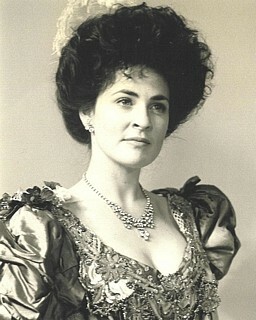 In his production of Anne of Green Gables: The Sequel I was cast as the “other woman”, Elvira Evans. My part was not a large one and I was only on the set for 4 days, but for my first day of shooting I was flown to PEI where we would shoot the very first scene of the film. I had never been to PEI, and so it was heavenly, to be shooting our scene at the seaside resort ~ 'Dalvay By The Sea' (in the script known as the White Sands Hotel) with all its beauty, history and elegance. I felt like I was taken back in time as we were gathered together outside this majestic hotel, in our vintage finery, looking out to the sight of spectacular sand dunes which adorned the water's edge for as far as the eye could see. Again, I had the opportunity to work with the best of the best, being Megan Follows as the beloved Anne Shirley ...a phenomenal talent and professional. 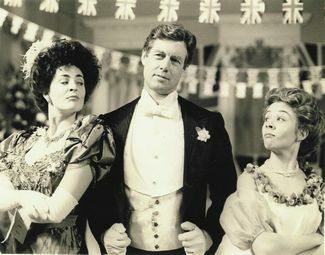 As seen by this photo, we had great fun as we continued to jokingly tease each other, on and off the set, with our rivalry for our dear Morgan played by Frank Converse. This production will always remain a favorite for many with its timeless story of Anne Shirley and her many adventures, her generous spirit and passionate heart. 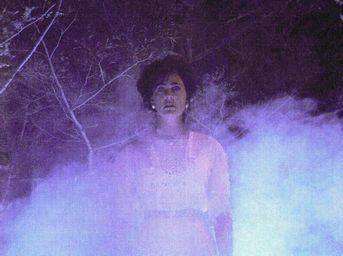 My work with Kevin Sullivan continued when he hired me to play Evelyn Morrow in his production of Lantern Hill. This film starred Mairon Bennett, Sam Waterston (from Law & Order fame), and also a young and talented Canadian actress by the name of Sarah Polley, who is now a well renowned actress, producer & director with her acclaimed directing debut Away From Her and her many film credits. An interesting part, as I was cast as a woman with a tortured heart and would be introduced throughout the production through flashbacks & ghost scenes...as I was a very dead woman. No lines...just deadness...smile. Music was always part of my life throughout this time; I was always in and out of the studio recording my own songs. I was pleased to be recognized with a New Talent Award and two Songwriter’s Awards from FACTOR and to be included on two of their Compilation CD’s. 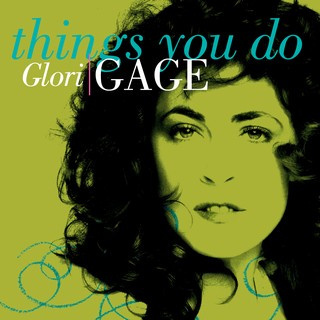 The songs Things You Do and Heart of Hearts where the two songs that were chosen to be included on these Compilation CDs and distributed across Canada for radio airplay. I will never forget the moment that my song was played on the radio. It was one night after work when my sister and I were in our apartment and we just stared at the stereo ....there it was...my song on the radio! I think that was the only time that we heard it...ha!...but it didn`t matter because in that moment it felt like my song was # 1 in the world! I have always loved being in the studio, as I love the intimacy that a sound studio provides....just me, my mic and the music! Also time in the studio always takes me back to those treasured memories of being on my backyard swing...my own little place to let my voice soar! The seed that had been planted so long ago, had now grown into a desire to create something very special, and it was at this time that Treasured Memories Music was born. A series of CD's that would be best described as 'gentle renderings of timeless classics'. I felt with the challenges in our world and in our lives that we needed something gentle....something that would calm the heart and feed the soul. I wanted my first CD ~ Treasured Memories: Quiet Moments, to be a tribute of those treasured songs of the 30’s & 40’s...I'm in the Mood for Love, Always, For Sentimental Reasons, songs that had beautiful simply lyrics, and gentle music. It was suggested that I contact the talented David Warrack. I truly wanted to create something intimate and gentle and felt that this CD would be recorded with just piano and voice. Also David & I thought that we would do something a bit different and record this CD in an analog format to truly give it a true feeling of ‘a time past’. David’s performance on the piano, with his rich arrangements of these 30’s & 40’s timeless classics helped make my dream become a reality. 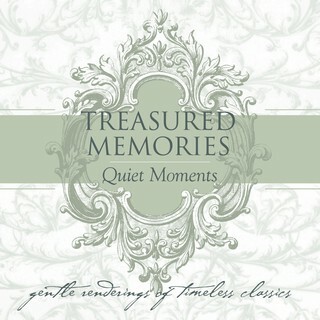 My dream continued with my second CD ~ Treasured Memories: Christmas Classics. 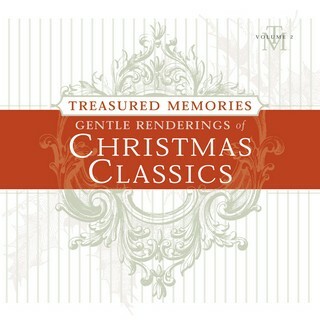 These traditional Christmas songs have always been close to my heart and decided on these songs for this collection O Holy Night, Silent Night, Still Still Still, What is this Lovely Fragrance, The Little Drummer Boy, Away in the Manger...and more. With this CD, I used a different creative team to achieve something a little different, something very special. The gifted John Sheard, led the team with his skill on the piano and his arrangements of each song’s gentle orchestration. I was also fortunate to have John produce this CD. 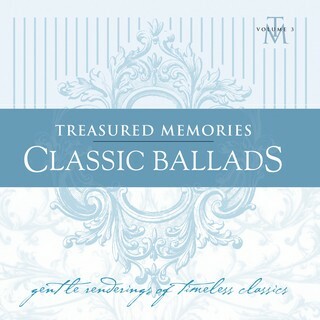 My third CD ~ Treasured Memories: Classic Ballads is a collection of beautiful ballads that dominated the radio air waves in the 70’s with songs like Close to You, Annie's Song, Play Me, You Make Me Feel Brand New...to name a few and touched us in so many ways. The wonderful and talented John Sheard again produced and created the very intimate arrangements, with the addition of David Wipper on acoustic guitar. With the suggestion by our engineer Nik Tjelious we recorded my vocals with 2 microphones adding an even more intimate and sultry feel to this CD. I have now added another CD to my growing series, Sacred Songs a collection including Be Still My Soul, Ave Maria, Here I Am, Lord, I Ask the Lord...and more. This most precious CD was inspired by a wonderful meeting of Esther and Ben Sanidad whom I met in 1997. This story is truly an inspirational one and is mentioned in Dr. Ben Sanidad's book Choosing to Live...a book about courage, faith and great love. Their love, support and generosity of spirit, made this specific CD become a reality. 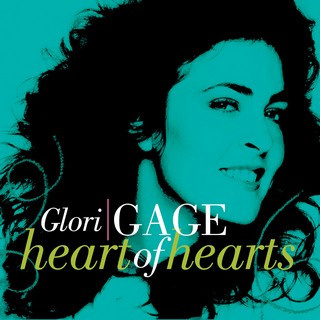 My ever talented and treasured John Sheard again arranged/produced this album. John also brought a new addition to this CD with the engineering talents of L. Stu Young. Our studio team was set with these magnificent men and their amazing talents and professionalism. I have been blessed by receiving radio air play in Canada, the U.S. and now, thanks to cdbaby.com, which is an amazing distributor for independent artists; my music is now being heard in Europe, Australia, Japan and around the world. Thank for you for taking the time to read about my life...my journey. I hope that in my sharing, it has brought a smile to your face, reminded you of a treasured memory, or have touched you by having recorded one of your favorite songs. My wish to you is that this music touches your life as it has touched mine."